LinkedIn’s new endorsement is so easy to use, it’s sometimes misused, in my opinion. Here are some things you should know about giving others endorsements and why you need to manage endorsements given to you. Now it’s easier to recommend your connections on LinkedIn, using a new feature called endorsements. Endorsements allow you to endorse one or more skills that your connection claims to have on their profile. You can also add a skill to endorse, if you’re so inclined. 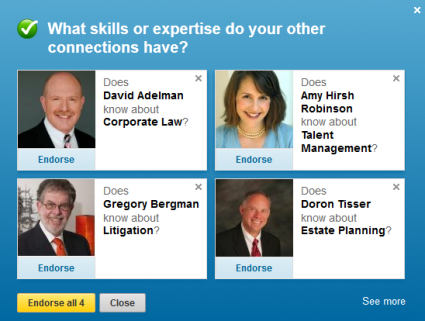 To learn how endorsements work, read my blog post, B2B Marketers: How To Use LinkedIn Endorsements. But LinkedIn has made this so easy, people are endorsing skills that connections don’t have – and sometimes adding skills that make no sense. Take my profile, for example. I’ve been doing Search Engine Optimization (SEO) since 1998. It is a skill I learned myself in the early days of websites by reading online articles by the very few SEO experts on the Internet. When LinkedIn added endorsements, I went to my profile to check it out. I had several endorsements, including many for a skill called “Optimisations”. Huh, puzzling. LinkedIn’s definition for this skill was something related to IT services – not my SEO skill. I deleted the skill along with several endorsements by my well-meaning connections. By making endorsements such a one-click no-brainer, I’m concerned that they are not as meaningful as recommendations, which have to be written, submitted and approved by the recipient. My recommendation is to be very careful with endorsements – in making them (for example, does an insurance broker really do strategic planning? The kind they teach you in business school? Really?) and in managing them. If LinkedIn weighs endorsements in its internal search algorithm, and the endorsements are not exactly true, won’t the credibility of LinkedIn data be diminished? Jennifer, I couldn’t agree with you more! I also see people with skills listed that I don’t think they really have (e.g., people who say “focus groups” when I know they don’t moderate at all) – and I don’t think this reflects well on them. Between the two aspects, I think LinkedIn took a misstep here. Caryn, thanks for the comment. Unfortunately, it’s a feature right out of the textbook called “Don’t Make Me Think: A Common Sense Approach to Web Usability.” (Great book by the way.) Note the first part of the title. Need we say more? Next post: B2B Marketers: Why You Should “F” Your Website Content!